Taiwan is going full throttle to becoming a popular and Muslim-friendly tourist destination. With more than 150 restaurants, hotels, and other business operations having obtained Halal certification in Taiwan, Taiwan is now a preferred travel destination from the Middle East. Last year, the number of tourists from the Middle East set a new high record, followed by further double-digit year-on-year growth of 13.64 per cent in the first two months of 2018. 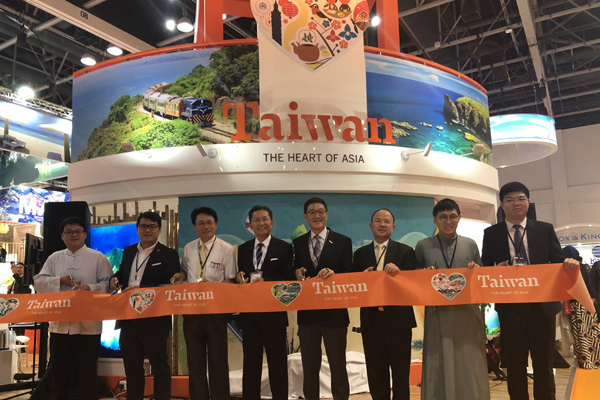 To tap into this fast-growing market, Taiwan Tourism Bureau (TTB) participated in Arabian Travel Market (ATM), the largest travel industry fair in the Middle East held annually in Dubai. With a 2-storey high pavilion featuring the country's beautiful coastlines, offshore islets, and for the first time, the stand also featured the quaint streets and mountains of Jiufen. The TTB delegation attending ATM was headed by Dr Trust Lin, director, Taiwan Tourism Bureau, Singapore Office, and included Lion Travel Service, Pro Tours Express, the Chinese Muslim Association, Xing Yuan Tea Farm and Big 5 Tours. Also performing at the stand were music band Liu Sheng Ji who showcased their famous video “Breakout” that received 100,000 views on youtube within seven days. Calligraphy artist Ku Chi-chun, tea taster Liu Ching-yuan, aluminium wire artist Teng Chia-Ming were also present to engage with the hordes of visitors that flocked at the stand. The director of the Taiwan Tourism Bureau Singapore Office, Trust Lin, said that Taiwan has been dedicated to becoming a Muslim-friendly destination, with restaurants, hotels, leisure farms and other business operations having obtained Halal certifications, and that can be attributed to the double-digit growth of the travellers from Muslim nations. Among the fastest growing travellers from Muslim-majority countries, the UAE comes first, with more than 20 per cent growth.